Journey into Film – Everyone else is doing it, so why not me? Full disclosure, I wrote this review after I saw the film on opening night back in August, but embarrassingly, I forgot to post it. I am still working through my reviews for The Predator, Venom and A Star is Born, but due to my commitments with both university and work, it’s taking a lot longer than expected. Anyway, onto the review! Marvel has come under much scrutiny of late, with the extremely controversial firing of Guardians of the Galaxy director James Gunn still a major issue of debate over a month after his dismissal. Although Gunn’s dismissal is the main controversy of debate at the moment, many fans were furious with Marvel several months prior to it. Furious because Marvel had elected to delay the release of Ant-Man and the Wasp in several major countries around the world, including the UK, by a full month. This has unsurprisingly, affected the film’s box office earnings, with many fans, in an effort to avoid spoilers, watching pirated versions of the film online. Fortunately, I was able to avoid spoilers and was able to go into the film completely unspoiled. As someone who didn’t particularly care for Ant-Man, my anticipation for the sequel was rather low, that was until Avengers: Infinity War. Following the events that transpired in Marvels’s earlier cinematic event, there was a great deal of intrigue as to how Ant-Man and the Wasp would acknowledge Infinity War, if at all. So it must come as a shock to both Disney and Marvel that the film has struggled at the box office (it has still managed to make $465 million at the time of writing). Ant-Man and the Wasp continues the adventures of Scott Lang (Paul Rudd), who is approaching the end of his 2-year house arrest sentence after his involvement in the airport showdown in Captain America: Civil War. 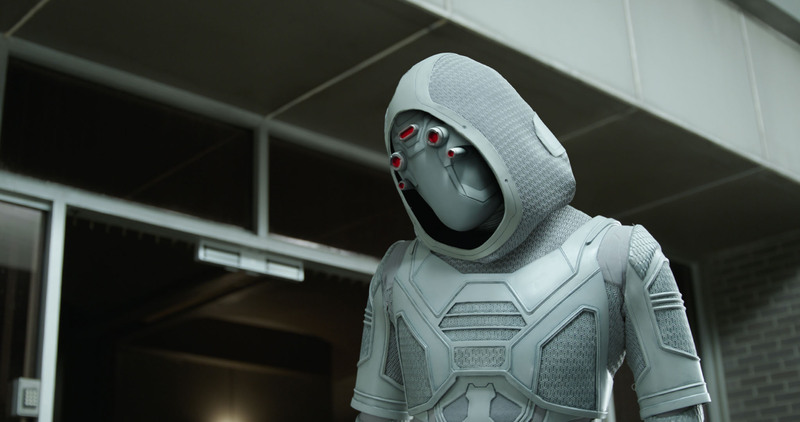 Scott finds himself putting on the Ant-Man suit again in an effort to rescue Janet van Dyne (Michelle Pfeiffer) from the Quantum Realm, whilst being hunted by the mysterious Ghost (Hannah John-Kamen). Similar to all but one of the Marvel Cinematic Universe (MCU) films, there is a major emphasis on fun with Ant-Man and the Wasp. The sense of fun is everywhere in the film. The situations that the characters repeatedly find themselves in are perfectly ridiculous, yet remain small-scale enough to give the film a familiar tone to that of the first film. Arguably the most important factor of Ant-Man and the Wasp are the performances of stars Paul Rudd and Evangeline Lilly. The two feel perfectly at home in the MCU and their back and forth is easily one of the most entertaining aspects of the film. Meanwhile, Scott Lang’s daughter Cassie (Abby Ryder Forston) is given a slightly more fleshed out role, and Forston uses it to create a heartwarming character, and in many ways, Cassie is the heart and soul of the entire film. Marvel is repeatedly, and justifiably, criticised for having a major problem in crafting well-developed villains. However, Ant-Man and the Wasp has actually succeeded to a certain degree. Hannah John-Kanem’s character Ava Sharp, A.K.A. Ghost, is a relatable and sympathetic character, who is not a villain in the traditional sense. However, she is, like most antagonists in Marvel films, underused. There is a lot of potential with her character, but unfortunately, none of it is fulfilled. If there was one thing that was an absolute standout of the original Ant-Man, it was easily the fantastic visual effects. The same can be said for Ant-Man and the Wasp, which boasts some of the MCU’s best visual effects, which is quite an accomplishment. However, the effects are not perfect, as the film enters its third act, and the Quantum Realm is further explored, it becomes painstakingly clear, that the actors are standing in front of green screens. If I had to pick the best moment of the film, it is without a doubt the brilliant post-credits scenes. The MCU has a history of tantalising post-credits scenes, but Ant-Man and the Wasp‘s might just be the best and most tantalising. I won’t say anything about it, but if you still have not seen the film, go see it just for the first post-credits scene alone. It is not only extremely entertaining, but it provides a major clue regarding the currently untitled Avengers 4. It is a well-known fact that Edgar Wright (Shaun of the Dead, Baby Driver) was supposed to direct Ant-Man, having been in active development with Marvel for 10 years before he was unceremoniously fired (or walked away) from the project, just a few months before principal photography was set to begin. The project was something that Wright had a clear passion for, and his exit from the film was a huge loss. Naturally, Marvel swiftly hired a new director in the form of Peyton Reed (The Break-Up, Yes Man), and while the film was a critical success, Reed’s direction was a main source of criticism. Unfortunately, the same can be said for Ant-Man and the Wasp, which is seriously let down by Reed’s bland direction, that lacks in creativity. It is really a damn shame that Edgar Wright and Marvel failed to find common ground during the development process, as his version would have been a much more creatively impressive film. There had been much anticipation around Michelle Pfeiffer’s role as Janet Van Dyne, prior to the film’s release. Therefore, its such a disappointment that her entire role boils down to less than 10 minutes of screentime. Her appearance is extremely predictable and lacks any imaginative innovation. The same can be said for the rest of the supporting cast. Not a single character, outside of the main cast, brings anything significant to the film. The most popular characters from the first film, Luis (Michael Peña), Dave (Tip Harris) and Kurt (David Dastmalchian) are nothing but downright annoying in the sequel. As mentioned earlier, the film’s primary antagonist, Ava Sharp, isn’t really a villain, and thus, Ant-Man and the Wasp lacks a true antagonist. It could be argued that Walton Goggin’s character, Sonny Burch, is the main villain but he feels as though he belongs in a cartoon, giving how his character is crafted in the script. The film also has a pacing issue. The film feels significantly longer than its modest two-hour runtime. This is largely due to the often overlong comedic sequences that quickly become tiresome. Following Avengers: Infinity War, many were left wondering how Ant-Man and the Wasp would handle the fallout of the film, if at all. However, as the film is set before Infinity War, it makes all of the accomplishments and consequences that the characters face feel obsolete. As a result of this, Ant-Man and the Wasp feels like an empty viewing experience, with the exception of the fantastic post-credit sequences. Additionally, the action sequences are mostly forgettable. When compared to the first film, with the brilliant toy train sequence at its climax, there appears to be a general lack of creativity with the sequel. However, to give credit where its due, there is a highly entertaining sequence featuring The Wasp in a kitchen which shows that there was still that creative spark Reed had when crafting the first film’s action sequences. One final issue I have with Ant-Man and the Wasp is that the romance between Scott and Hope still feels ridiculously forced. It is given much more attention in the sequel, something which isn’t exactly hard considering the only attention to the romance in the first film was the revelation at the end, that the pair were hooking up. In the end, Ant-Man and the Wasp is a fun but ultimately forgettable sequel that provides a lot of laughs but lacks in well-crafted action set pieces and characters. ‘Mission: Impossible- Fallout’ Review: The Best Action Film Ever? Usually, as a franchise reaches its sixth entry, the quality has plummeted significantly and audience interest is waning. However, some franchises, such as Fast and Furious and JK Rowling’s Wizarding World, manages to maintain audience interest and in some even rarer cases, get better with each entry. 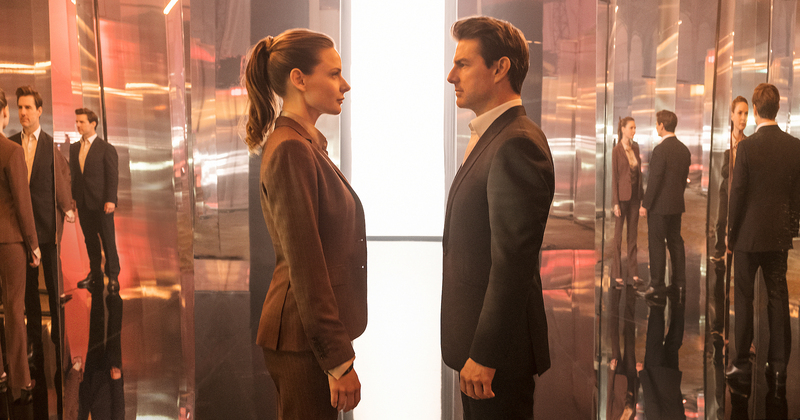 The Mission: Impossible franchise has had its ups and downs over the years, but although the quality has varied, the franchise continues to be a staple of the action genre. Mission: Impossible- Fallout continues the adventures of Ethan Hunt (Tom Cruise) and his team. 2 years after apprehending Solomon Lane (Sean Harris), Ethan and his team are forced to race against time to recover plutonium from a terrorist group known as The Apostles, after a mission gone wrong. 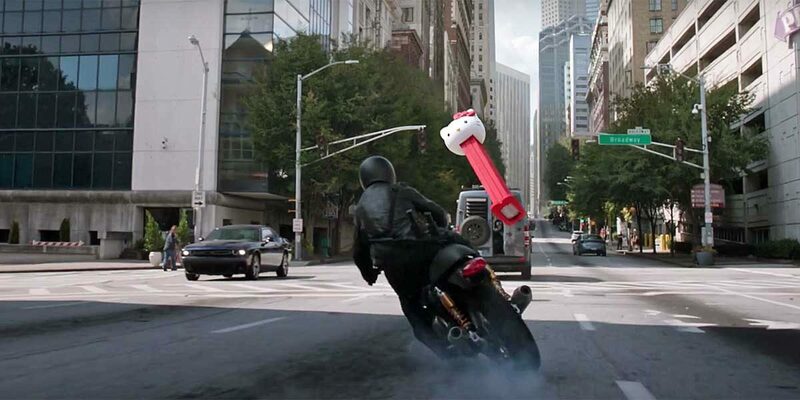 It goes without saying, that the Mission: Impossible films have become best known for their outstanding action set pieces. What makes them even more impressive, is that they are almost entirely stuntmen free. Tom Cruise continues to raise the bar for action spectacle and in Fallout, he has completely outdone himself. There had been much anticipation for the halo jump that had been a frequent part of the film’s marketing. For the sequence, Tom Cruise jumped out of a plane, (25,000 feet above the ground) 106 times in order to get the perfect take, and thanks to his dedication to his craft, the sequence stands out as a highlight in a film filled with jaw-dropping set pieces. Another outstanding sequence is a bathroom brawl that is magnificently brutal and choreographed to perfection. Of course, I can’t praise the action without mentioning the riveting Paris motorcycle chase or the intense Helicopter battle. There is not one single second of action that fails to stand out among the best within the industry, and a lot of that has to do with director Christopher McQuarrie who has clearly mastered the art of crafting instantly iconic action. Although the action is naturally one of the standouts of the film, it is not the only aspect of the film that succeeds. Previous entries in the franchise have had a hard time crafting genuinely intriguing storylines and villains, however, with Fallout, the franchise has finally delivered with both. The film’s pacing has been brilliantly structured around the action, and therefore it is unsurprising that the film flies by despite the 148-minute runtime. What makes the film even more impressive is that the film started shooting without an actual script. This could have seriously backfired. However, unlike previous entries, the narrative is actually interesting. Serving as a direct continuation of Rogue Nation, the film further explores the consequences of the secret agent life, adding much more depth to the characters of Ethan Hunt and his team. That being said, the plot does at times feel slightly generic. Henry Cavill was the subject of many discussions during and after the film’s production. It wasn’t about any controversy or poor behaviour, instead, it was all about his facial hair. You probably all know the details: he grew a moustache for Fallout, but was required to film reshoots for Justice League, however, was unable to shave it off and thus we got the terrible GCI lip in Justice League. I’m not going to dwell on the issue as it has already been discussed countless times over whether it was worth it for Paramount to refuse to allow him to shave it off. All I’m going to say is, it absolutely was. In Fallout, Cavill plays CIA agent August Walker, who is tasked to work with Ethan Hunt and has orders to eliminate him should Hunt spiral out of control. Cavill’s career has been mixed so far, as he has yet to deliver a truly great performance that proves he deserves the massive roles he has been given. Fortunately, in Mission: Impossible- Fallout, Henry Cavill is by far the best he has ever been. He perfectly portrays Walker and manages to stand out with ease alongside Tom Cruise. Walker instantly becomes one of the best characters that the franchise has introduced, largely thanks to Cavill’s performance. The character has a fascinating relationship with Hunt and their exchanges remain a highlight of the film. As mentioned earlier, the Mission: Impossible franchise has long struggled to create genuinely interesting villains. Prior to Rogue Nation (the fifth entry in the franchise), the only well-crafted villain was Owen Davian, portrayed by the late, great Philip Seymour Hoffman, in Mission: Impossible III. That was until Rogue Nation introduced Solomon Lane (Sean Harris), who feels like a villain more suited for a James Bond film, but in a good way. Before the franchise figured out its formula, it previously tried to be similar to Bond with Mission: Impossible II, something which seriously backfired. Harris has a subtlety unhinged presence in the role, which gives the character a sense of unpredictability. As a result of this, he is easily the best villain in the franchise, although that really isn’t saying much. Aside from the action, there is plenty of emotion in the film, with the return of Ethan’s estranged ex-wife, Julia (Michelle Monaghan). It is through Julia that the character of Ethan Hunt is best explored as she represents the sacrifices and heartbreak that Ethan has to endure with his line of work. Monaghan doesn’t have much screentime in the film but she feels perfectly placed in a film filled with stars, and despite not appearing in the franchise for twelve years, delivers a performance that emphasises that the character of Julia has evolved. Rogue Nation may have introduced the franchise’s best villain, but it also introduced its best female character, Ilsa Faust, played magnificently by Rebecca Ferguson. Ferguson delivered a performance that actually outshone Cruise and she has done so again in Fallout. The character of Ilsa is not only the best female character in the franchise but easily one of the best characters overall in the franchise. This is largely because both Rogue Nation and Fallout effectively utilise her as not only a romantic interest for Hunt but as a fully capable, conflicted spy herself, and she manages to steal every scene she is in. Rebecca Ferguson was relatively unknown prior to Rogue Nation, but thanks to her performances in that film and Fallout, she has already been cast in some major upcoming films, and its safe to say she has an incredible career ahead of her, and she absolutely deserves it. Lorne Balfe’s score is just another aspect of the film that succeeds on every level. It is definitely the best of the franchise and is used well alongside its action-packed scenes, as well as a balance for the more emotionally toned moments. Looking back at the very first film in the franchise is a mixed experience. There are some truly brilliant scenes, crafted excellently by director Brian de Palma, however, in terms of visuals, the film is seriously lacking in quality. The same cannot be said for Fallout, which is absolutely beautiful. Cinematographer Rob Hardy (Ex Machina, Annihilation) continues to prove that he is one of the best cinematographers working in the industry today, with Fallout being another impressive example of his talents. Although the franchise is understandably focused on Cruise, it has been clear since the fourth entry, Ghost Protocol, that it is at is best when Hunt as a team to back him up. The supporting cast remains excellent, with franchise veteran Ving Rhames returning as the charismatic Luther Stickell, and the ever-reliable Simon Pegg, who now feels perfectly at home with the franchise, also returning. Pegg naturally adds some comic relief, however, the film makes it clear right from the start that Benji’s role is much more than simply making the audience laugh. As for the new additions to the franchise, the results are more mixed. Vanessa Kirby (The Crown) does impress, unfortunately, her screen time is extremely limited. Hopefully, she’ll return as her character is a fascinating addition to the franchise. Angela Basset is not so lucky. Limited to even less screentime than Kirby, she really adds nothing to the film and feels like more of an afterthought. Despite the excellent supporting cast, there is one noticeable absence: Jeremy Renner. Introduced in Ghost Protocol, Renner’s character, William Brandt, became a fan favourite. Unfortunately, Renner was unable to have a major role in the film due to his Avengers commitments, although he did turn down a cameo that would have seen Brandt killed in the opening act (good call Jeremy). Although Renner’s absence does not detract from the film, it is disappointing. A final positive is the subtle references throughout the film towards the previous entries in the franchise. Fallout features several uses of lens flare, a technique frequently utilised by Mission: Impossible III director, JJ Abrams. It also has several moments where the team’s equipment fails to work, which serves as a reference to Ghost Protocol. I’m sure there are many other references to previous entries in the franchise, and although these references are not significant in any manner, McQuarrie’s decision to include these are an effective way to show his appreciation for the franchise’s history, which adds even more to the film. 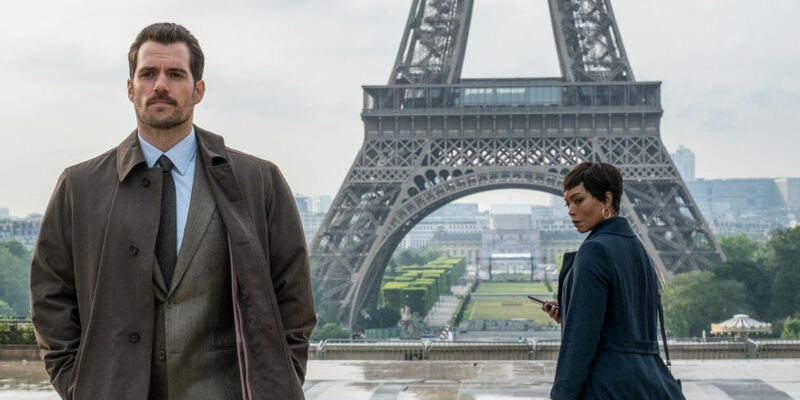 There is really only one negative thing, other than wasted cast members, that I can point out about Mission: Impossible- Fallout, and that is its predictable ending. As the third act begins, it becomes obvious how the film will end, and while that is frustrating, it doesn’t make the ride any less enjoyable. In the end, Mission: Impossible- Fallout is easily the best film in the franchise and might just be the best action film of the 21st century so far. The film has some truly jaw-dropping set pieces, however, thanks to a compelling plot and entertaining characters, it is not overly reliant on them. In years to come, Mission: Impossible- Fallout may be considered a masterpiece of the action genre, and with good reason. Firstly, it needs to be said that this review has been written almost two weeks after I saw the film, and as such, is much shorter. Following the surprising box-office success of Denis Villeneuve’s fantastic, Oscar-nominated, Sicario, Lionsgate quickly announced a sequel. The announcement was met with mixed reactions, as it did nothing but scream “money grab”. Expectations for the film dropped significantly when it was confirmed that neither Villeneuve or cinematographer Roger Deakins would return. Soon after it was announced that star Emily Blunt would not be reprising her role either, furthering damaging expectations for the sequel. Despite the fact that both Benicio del Toro and Josh Brolin would be reprising their roles, anticipation for the sequel was rather low. Sicario: Day of the Soldado continues the story of Alejandro Gillick (Benicio del Toro) and Matt Graver (Josh Brolin). After a terrorist attack, Graver recruits Alejandro for a mission to reignite a war between rival Cartels, of whom the US Department of Defense believes responsible for transporting the terrorists into the United States. Villeneuve’s film was shockingly brutal and, thankfully, the same can be said for the sequel. The film sets its tone with a heartbreakingly realistic scene that deals with an issue that the world has become all too common with: suicide bombings. It’s a scene that doesn’t hold back and immediately establishes the themes and plot elements that drive the narrative. As the film goes on, it further pushes the boundaries in terms of its representation of governments. The first film established the corrupt and morally ambiguous decisions made by governments around the world on a daily basis. The sequel advances these representations of governments, who plot to turn the Cartels against each other by kidnapping the teenage daughter of a Cartel Kingpin and making it appear as though his rivals are the kidnappers. It’s an act that questions the audiences faith in their own government, whether they are American or not. While the sequel is lacking the talents of Emily Blunt, it still has a strong female performer that truly stands out as a potential star: Isabela Moner. Playing the teenage daughter of a Cartel Kingpin, she is repeatedly required to go to extreme levels of emotional distress and she succeeds every time. Considering her co-stars involve both Benicio del Toro and Josh Brolin, it says a lot about her talent, that she manages to completely steal the show. Her character, Isabella Reyes, is a compelling standout. Right from her introduction, her character’s personality is established as a self-sufficient teen, however, upon meeting Alejandro, her vulnerable nature is revealed in a brilliant dynamic that bears similarities to the pairing of Logan (Hugh Jackman) and Laura (Dafne Keen) in Logan. While their dynamic is interesting, the film, unfortunately, doesn’t spend enough time developing their relationship. The pairing of Benicio del Toro and Josh Brolin was brilliant in the original film, with both cast members delivering outstanding performances. So its pleasing to see that the pair once again deliver fantastic performances. Granted, its nowhere near being career-defining performances, but both are still brilliant nonetheless. One thing that sets the sequel apart from its predecessor is the increased focus on action. Sicario had a few shootouts and explosions, but they were extremely small in scale. Although the shootouts in Day of the Soldado are still smaller than the average film about Cartels, they remain thoroughly entertaining, regardless of their brief nature. Additionally, much like the first film, Day of the Soldado is filled with suspense. This is largely due to the fact that the film has no clear protagonists or antagonists. Every single character, including Isabella Reyes, have dark sides to their characters, and this leads the audience to question the character’s motives and the morality of their actions. Day of the Soldado succeeds because it returns the audience to the dark corner of the world that the first film introduced and manages to perfectly recapture the panic-inducing tone of Villeneuve’s film. The soundtrack, composed by Hildur Guðnadóttir, strikes the same eery tones of the late Jóhann Jóhannsson’s original score, which adds another sinister level to the tense scenes throughout the film. Of course, Day of the Soldado definitely misses the presence of Villeneuve, (who is one of the best directors working today), and his frequent collaborator Roger Deakins (who is one of the best cinematographers working today). Although the directing and cinematography is done well, it often comes across as an attempt to copy the works of Villeneuve and Deakins. Another presence that the film does miss is Emily Blunt. She provided the emotional elements to the original film, and while Isabella Moner is exceptional in Day of the Soldado, Blunt’s charisma still seems frustratingly forgotten. The script suffers from really poor pacing. Unlike Sicario‘s script, (which was nominated for several awards), Day of the Soldado‘s just feels somewhat incomplete. This is largely due to the film’s desperate desire to suddenly reach its conclusion. As the film approaches its final twenty minutes, all plotlines begin to wrap up instantly, with very little resolution. This proved to be the most frustrating aspect of my viewing experience. I wanted more of Isabella Reyes’ relationship with Alejandro, as there is nowhere near enough time spent focusing on their dynamic, which in the brief time that they spend together, was the most interesting aspect of the film. I wanted more resolution to the various character arcs introduced in the film. Unfortunately, the film employs a typical sequel bait ending, which fails to inspire confidence in the planned threequel. The sequel bait ending would not be as big an issue if the film didn’t rush to it. However, it does and it will leave the audience feeling unsatisfied as if they have only seen 3/4 of the film before it suddenly jumped to the final scene. Furthermore, it needs to be said that the film is completely unnecessary. The overall plot does very little to advance the hanging plotlines of Sicario, and at times, is overly convoluted. This results in an irritating viewing experience, despite the fact that the film is still thoroughly entertaining. Throughout the film, the narrative frequently cuts back to a teenage boy, who has recently joined the Cartel smuggling operation. If done well, this could have been an interesting subplot, however, every single time the film cut back to him, I found myself annoyed and just waiting to get back to Alejandro and Isabella. The subplot is ultimately an unnecessary subplot in an unnecessary sequel. However, unlike the film as a whole, this particular subplot is far from entertaining. Lastly, the film completely and utterly wastes two extremely talented actors: Matthew Modine and Shea Whigham. Modine is reduced to the typical government official, appearing in just two scenes. He does what he can with the role but given his limited screen time, is just another example of wasted talent. However, there remains a chance that he could return in the threequel, where he should be given a more significant role. As for Shea Whigham, he is given the most injustice by Day of the Soldado. Limited to just one scene, Shea Whigham (who I believe to be one of the most underrated actors around) has once again been trapped in a meaningless role, which will only further convince Hollywood that he should only ever be cast in minor roles. Unless a miracle happens, Shea Whigham is destined to join the list of incredibly talented actors who struggle to get any major roles after their television shows have ended. In the end, Sicario: Day of the Soldado is an unnecessary but mostly satisfying follow-up to Denis Villeneuve’s film. ‘Jurassic World: Fallen Kingdom’ Review: The Worst One Yet? The Jurassic franchise is currently in a situation that many franchises experience at their fifth entry. Those in charge need to ask themselves a question: “What must we do now to keep the franchise fresh and the audience interested?” The Fast and Furious franchise brought the Dwayne “The Rock” Johnson onboard and he turned the series into a Goliath at the box office. Die Hard decided to introduce John McClane’s son, played by Jai Courtney, as an agent of the CIA, and the results were the exact opposite. Franchises nowadays need to take risks to stay relevant, and unsurprisingly, this wields mixed results. The Jurassic franchise decided to take its major risk in the fourth entry, Jurassic World, by introducing the concept of hybrid dinosaurs. The idea is interesting as well as being a bit absurd, but what made it successful is that the film acknowledges this. The characters repeatedly make jokes about having to constantly add more ‘wow-factor’ to please the customers, which is, of course, a reference to the film industry having to constantly evolve to keep up with its ever-changing audience. Although I had my issues with Jurassic World (basically anything to do with Vincent D’Onofrio’s character), I liked it for what it was: a studio film desperate to reignite the love for a franchise that hadn’t released a film in 14 years. So as someone who liked Jurassic World and as someone who has always had a fondness for the franchise, I was optimistic about the sequel to Colin Trevorrow’s 2015 film. Jurassic World: Fallen Kingdom takes place three years after the events of Jurassic World. The park has since been abandoned, however, after the discovery that the volcano on the island is preparing to erupt, a team return to Isla Nublar to save as many dinosaurs as they can. Firstly, the best aspect of the film is the chemistry between Chris Pratt and Bryce Dallas Howard as Owen Grady and Claire Dearing respectively. The pair has a great onscreen relationship that is a pure joy to watch. Fallen Kingdom advances their relationship by adding drama to their dynamic as the pair have both dated and separated since the events of Jurassic World. As a result, there is a fun romantic and sexual tension between the pair that adds plenty of humour to a rather darker entry into the Jurassic franchise. The relationship is believable largely due to the charismatic performances of both Pratt and Howard. It is hard to picture the film being as enjoyable to watch with other actors in the roles. In the lead-up to release, director J.A Bayona (The Impossible, A Monster Calls) emphasised that the film was heavily influenced by the horror genre, a genre that Bayona has experience in with his Spanish language film The Orphanage (Originally titled, El Orfanato). The film has some exceptional horror imagery, clearly inspired by the classics of the genre, that are utilised superbly by Bayona who crafts some genuinely terrifying scares. The horror aspect of the film is most prominent during the second half of the film, once the narrative takes the action away from Isla Nublar and into the confines of a mansion. Once inside the mansion, the film has clear parallels to classic haunted house films, easily making it the scariest Jurassic film yet. Traditionally, children have been the most irritating aspects of the films, however, that is not the case with Fallen Kingdom. The film features a genuinely compelling subplot revolving around Maisie Lockwood (Isabella Sermon), the grand-daughter of Benjamin Lockwood (James Cromwell), former partner of Jurassic Park founder John Hammond (Richard Attenborough). Maisie is an entertaining character to watch, who doesn’t irritate even once. However, there is a twist involving Maisie which I have very mixed feelings on. Its something that some fans will love and others will absolutely hate. Regardless, newcomer Isabella Sermon has a bright future ahead if she so chooses to continue her acting career as she not only holds her own against Hollywood A-listers but actually outshines them repeatedly. 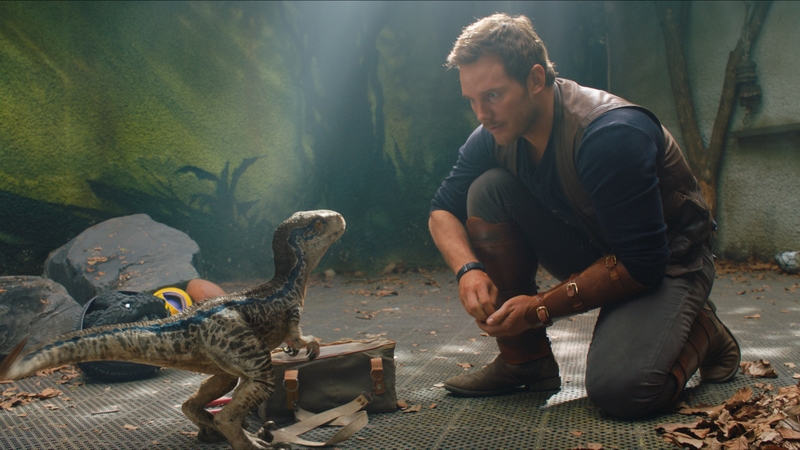 A criticism that many had about Jurassic World was the inconsistent visual effects. Thankfully, the visual effects in Fallen Kingdom are consistently impressive. Some may argue that the practical effects from the original film still hold up exceptionally well, which they do, but the CGI in Fallen Kingdom is so good that you often forget you’re watching computer created creatures. Nowadays, Michael Giacchino appears to be Hollywood’s “go-to-guy” for memorable, high-quality scores. His work perfectly feels at home in the franchise, echoing the darker tone that director J.A Bayona was going for. His score may not be as memorable as the one he composed for Jurassic World but it does the great John Williams proud. During the marketing, the standout moment used to build hype for the film was the volcanic eruption sequence. The time the film spends on Isla Nublar is disappointingly brief, however, remains the most entertaining part. As the narrative returns the characters to Isla Nublar, the film manages to emphasise a sense of nostalgia, not just for the previous film, but also the original 1993 Spielberg-directed classic. The eruption sequence is thoroughly entertaining from start to finish, with the reunion between Owen and his velociraptor friend Blue being a highlight of the film. Fallen Kingdom has a serious underlying message about animal rights, and it’s given serious attention during the events on Isla Nublar, as the volcano erupts, the characters are forced to watch helplessly as many Dinosaurs meet their tragic end. It is easily one of the most heartbreaking moments of the entire franchise, and the film is visually stunning during the sequence. Although the film has several standout moments, none are as memorable as the volcanic eruption sequence. It is simply a fantastic piece of thrilling entertainment. However, it does have flaws which I’ll get in to later. A final positive is Daniella Pineda’s character, Zia Rodriguez. Sarcastic and sassy, she is one of only two interesting new human characters to grace the screen in Fallen Kingdom. She doesn’t have that much to do, but whenever she appears on-screen, she is a delight to watch. Now on to the negatives, and there are so many that I won’t get into every single one here. Firstly, in typical Jurassic fashion, the humans are idiots. However, Fallen Kingdom takes this tradition and amplifies it to frankly absurd levels. Characters act in ways that no sane person ever would, and it becomes such a frustrating viewing experience that I was repeatedly hoping for characters to be devoured. The script, written by Colin Trevorrow and Derek Connolly, is really poor, and at times, laughable. There is literally a moment where Claire performs a blood transfusion on a T-Rex because she attended a blood drive once. Somehow, that gives her the knowledge to carry out the transfusion on a prehistoric animal. It’s so mind-numbingly stupid. Although I had mixed feelings regarding the introduction of hybrid dinosaurs in Jurassic World, the Indominus Rex was a terrifying presence throughout the film. The same cannot be said for the hybrid creation in Fallen Kingdom, the Indoraptor. That could be because it doesn’t actually appear until halfway through the film. However, when it finally does show up, it pales in comparison with the Indominus Rex. It’s repeatedly labelled as the “most dangerous creature to ever walk the Earth” but the film fails to justify this labelling. The Indominus Rex was capable of camouflage and out-smarting humans, meanwhile, the Indoraptor simply looks scary. Returning to the flaws I had with the volcano sequence, it like the vast majority of the script, is mind-numbingly stupid. I was worried about the sequence, after watching the trailer, where we saw Owen trying to outrun a pyroclastic flow. As it turns out, he does, and I burst out laughing while watching it unfold. Prior to that scene, Owen faces further danger from lava, whilst partly paralysed. He does a little dance on the ground and escapes from it. Once again, I burst out laughing. It’s a desperate attempt at humour but ends up being too funny for its own good, and totally compromises the darker tone that Bayona was aiming for. The Jurassic films have had serious problems with its human characters since the original film. As such, the audience tends to care more about the dinosaurs than they do about the humans. One of the highlights of the previous Jurassic films were the highly entertaining and over-the-top human deaths, emphasising how little the audience care about the humans. Unfortunately, there are actually surprisingly few human deaths in the film, and therefore, Fallen Kingdom lacks one of the main draws of the franchise. Furthering the topic of poor characters, two new additions portrayed by Rafe Spall and Toby Jones come across as nothing more than cartoon corporate villains. They would be more suited in a Nickelodeon cartoon than in a Hollywood blockbuster. Additionally, whilst Pratt’s character Owen is a lot of fun, Fallen Kingdom turns him into a full-blown superhero. At several points in the film, he seemingly takes on an entire squadron of soldiers single-handedly. 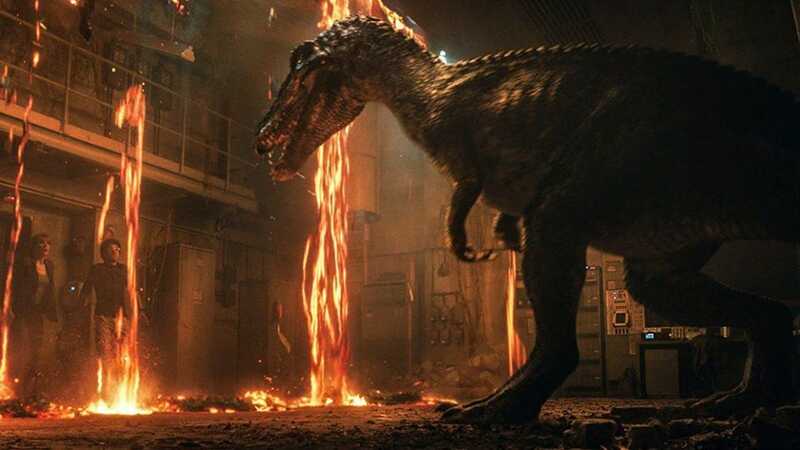 Owen was set up as a badass in Jurassic World, but Fallen Kingdom turns him into a full-blown superhero and it is as unbelievable as him outrunning a pyroclastic flow. Out of all the details that built hype for Fallen Kingdom, none were as significant as the news that franchise veteran Jeff Goldblum would be reprising his role as Dr Ian Malcolm. Granted, very few people expected him to have a major role, but very few will expect him to have as small a role as he ends up with. Considering the fact that Goldblum has been a significant factor of Fallen Kingdom‘s press events, it is so heartbreakingly disappointing that he has what is essentially a one-minute cameo, that both opens and closes the film. Stan Lee tends to get more screentime in his Marvel cameos, than what Jeff Goldblum has with his “supporting role”. Out of all the disappointments with Fallen Kingdom, this was the most devastating. Another new character that steals the show for all the wrong reasons is Franklin, portrayed by Justice Smith. Easily the most insufferable character in the film, he spends every second of his screentime whining and telling everyone how scared he is. He becomes such a nuisance that you are actually hoping that despite not being a villain, he suffers a horrific death. He may not be the most annoying character in the franchise, (that is still Téa Leoni’s Amanda Kirby from Jurassic Park III), but he is definitely a close runner-up. Lastly, the ending is Jurassic Park III all over again. The ending of Jurassic Park III is so despised that Jurassic World opted to ignore it completely. So I was blindsided by the decision to end Fallen Kingdom in such a similar way that it did nothing but infuriate me. If the introduction of hybrid dinosaurs wasn’t a good enough clue that the Jurassic franchise is officially out of ideas, then the ending definitely is. Also, there is a post-credits scene but it is absolutely worthless. All it does is reinforce the ending. The credits last roughly six or seven minutes, and then a twenty-second clip occurs which adds nothing new to the film. I just recommend that you wait for the film to be released on Blu-ray then you can fast forward to it. It really is that worthless. In the end, Jurassic World: Fallen Kingdom is a fun but ultimately forgettable entry which adds nothing new to the franchise. It instead chooses to rely on the “greatest hits” of the previous films, and unfortunately, the nostalgia only does so much. It may not be the worst film in the franchise, but it is certainly the dumbest. Following the mixed reception to Rian Johnson’s The Last Jedi, there was a lot riding on Solo succeeding, not only at the box office but with the fans as well. The Last Jedi was considered by many to be not only the worst Star Wars film of the Disney era but the worst film in the entire franchise. I personally liked it. It was by no means a perfect film. It had many flaws, most notably the over-reliance on, what some have coined: “Marvel humour”. The film did succeed in enhancing my excitement for the future of Star Wars, although it did nothing to improve my excitement for the next entry in the blockbuster franchise. Solo is a film that no-one was asking for, that no-one wanted and a film that appeared to be nothing more than a quick cash grab. It didn’t help that the film went through a hellish production, with original directors, Phil Lord and Christopher Miller (21 Jump Street, The Lego Movie), being fired from the project with weeks left of the original filming schedule. This announcement shocked the world and fueled countless rumours regarding their firing. The most persistent rumour was that the duo was taking far too many risks with the film for Lucasfilm head Kathleen Kennedy’s liking. Anticipation for the film was seriously damaged by the duo’s firing, as many, including myself, were mainly intrigued by Solo due to the prospect of Lord & Miller directing. Ultimately, Ron Howard (Apollo 13, Rush) was swiftly brought on to the project, reshooting almost the entire film in the process. 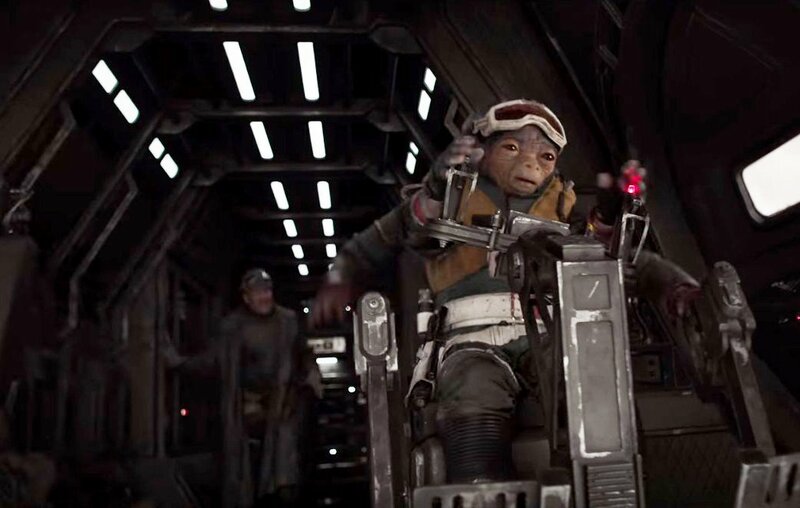 Howard’s hiring was rather uninspired, and it emphasised that Lucasfilm were unwilling to take any risks with Solo. The film seemed to have everything going against it right from the start, with the minimal fan excitement to its initial announcement, to Lord & Miller’s firing, to the worrying rumour that Disney was so disappointed by star Alden Ehrenreich’s performance, that they hired an acting coach. The marketing did little to inspire confidence in the man initially deemed worthy to play everyone’s favourite scruffy-looking nerf herder. Thankfully, Alden Ehrenreich proves himself to be more than capable of taking on the role made famous by Harrison Ford 41 years ago. He oozes both arrogance and charm, whilst also bringing a sense of naivety to the character which is something we have never seen before. Yes, he is no Harrison Ford, however, he is a perfectly capable replacement and has managed to further prove that the fans are not always right. Solo also showcased the first-ever meeting between the iconic duo of Han and Chewbacca (Joonas Suotamo). Their initial interaction is both clever and entertaining, and the development of their bond was handled well. Although the marketing failed to inspire confidence with Alden Ehrenreich, it certainly succeeded with Donald Glover as Lando Calrissian. The general consensus was that Glover was perfectly cast. He doesn’t steal the show as many predicted but he does steal almost every scene he is in. 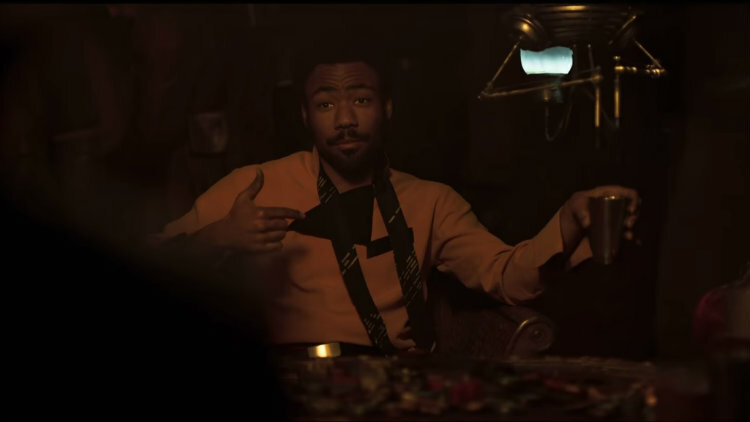 The film does a great job of further exploring the character, and Donald Glover has fantastic chemistry with Ehrenreich, which makes the developing friendship of Han and Lando all the more believable. Prior to the film’s release, rumours began swirling that Lucasfilm was already considering giving Lando his own spin-off film, and if the positive responses to Glover’s portrayal of the cape-wearing smuggler continue, it’s hard to see Lucasfilm passing on the idea. Traditionally, the droids were always my least favourite part of Star Wars. Granted, I did love R2 (who doesn’t?!) but they always felt a little shoehorned in, and some (C-3PO) are just downright annoying. However, with the new era of Star Wars, that has all changed. The Force Awakens introduced the world to BB-8 and he stole everyone’s hearts. Rogue One introduced K2-SO (Alan Tudyk) and he was the standout character of the entire film. Solo introduces L3-37 (Phoebe Waller-Bridge), Lando’s droid companion (and object of his affection!). 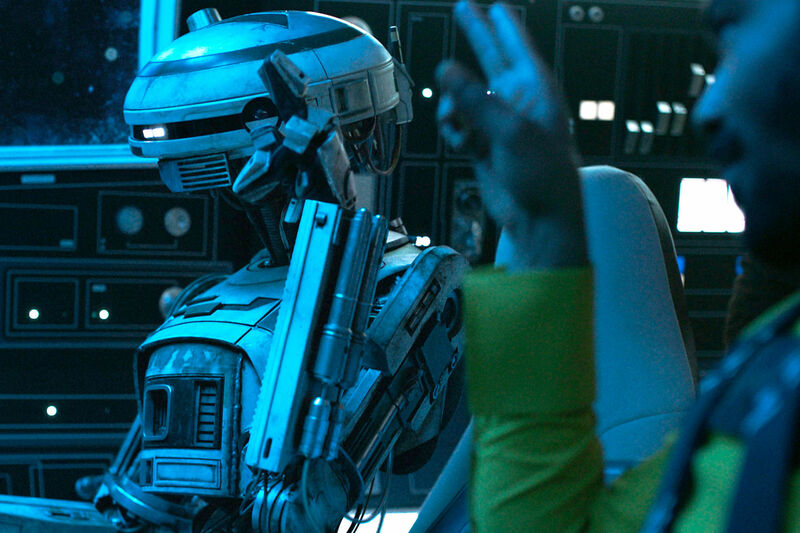 Sarcastic and, quite frankly, hilarious, L3-37 is the franchises first major female droid and despite the fact that she is made up of wires and metal, she is arguably the character that brings the most emotion and humanity to the film. The character won’t be as well-remembered as the loveable BB-8 or the rude K2-SO, but she should be. As you’d expect from a Star Wars film, there are plenty of stunning action set pieces to enjoy. Ron Howard crafts thoroughly entertaining action scenes that despite being smaller in scale than the other films, are no less impressive. The highlight is easily the long-awaited Kessel run which shows why Han Solo is considered to be one of the best pilots in the galaxy. Naturally, as the Kessel run is set entirely in space, it should come as no surprise that the set-piece was heavily reliant on visual effects, something which Star Wars is famous for excelling at and it does so with Solo. The Star Wars franchise is considered to be one of the most expansive fictional universes ever created with 41 years of history. So it continues to amaze me, how well the franchise continues to grow. Some of the planets, such as Han’s homeworld of Corellia, have been a part of the Star Wars universe for decades, although none have ever been seen on the screen before, big or small. Solo does an excellent job of introducing audiences to new worlds that feel perfectly at home in the Star Wars franchise. It is incredibly interesting to explore the influence that the Galactic Empire has in the farther reaches of space. I also appreciated that although the film is set during the period of the Empire, it doesn’t focus on them. This is a heist film and the Empire are merely background extras in the narrative. Star Wars has a history of iconic musical scores, predominantly from the living legend, John Williams. However, with the standalone films, Lucasfilm is giving other talented composers a chance to craft their own scores that will forever be associated with the galaxy far, far away. Michael Giacchino scored Rogue One in just two weeks, and it is astonishing that it’s as good as it is. For Solo, however, John Powell was given much more time and it shows, as he has created what is easily the best Star Wars score within the Disney era. 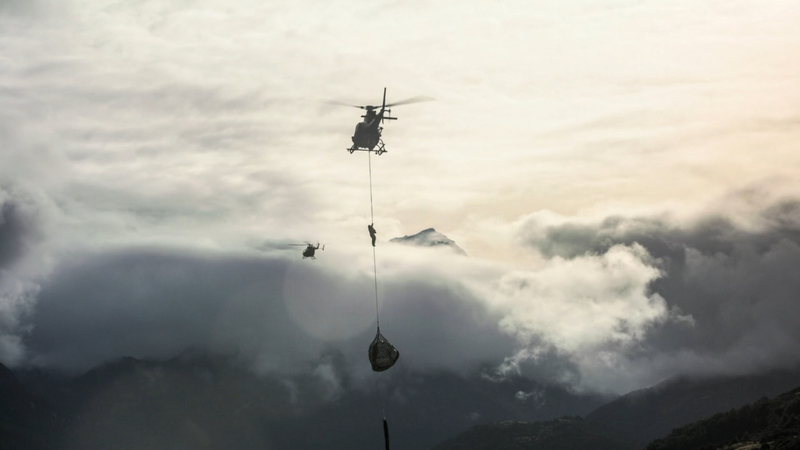 Bringing a real sense of epic grandeur to a rather small-scale film. His score continues the franchises’ legacy of brilliant music that will be remembered forever. A final positive is that the film does have some genuinely magnificent surprises. There were several moments where something happened that I had not expected and yet totally loved. However, the biggest surprise is something that fans of the prequel trilogy will surely love and had my jaw on the floor, and I’m not going to lie, I got a little teary-eyed. That being said, this film has a LOT of problems. Firstly, the lighting is absolutely terrible. The film is so dark that it is often a real challenge to watch. The opening ten minutes of the film really suffers from poor lighting as it was almost impossible to actually see what was happening. I found myself questioning whether the cinema’s projector wasn’t working, however, as the film went on, it became clear that there was nothing wrong with the projector, but the film. I was not the only one to think this, others came out, complaining that they struggled to see the events of the film unfold. Although The Last Jedi has come under serious criticism from fans, the one thing that most people agree on is that the film was unpredictable. That is not the case with Solo. Apart from the MASSIVE surprise that features in the film, the primary narrative is one that audiences have seen time and time again. It is so blatantly obvious that Lucasfilm wanted to play it safe with Solo as the film repeatedly shies away from taking any risks whatsoever with its script. The predictable nature of the film is epitomised by the characters of Tobias Beckett (Woody Harrelson) and Qi’ra (Emilia Clarke) who follow the typical mentor and love interest clichés that Hollywood has been using for decades and as a result of this, their arcs are obvious as soon as they appear on the screen. The film is seriously held back by its opening act. It simply takes far too long to get going and spends far too much time establishing character arcs that are never going to be concluded, at least on the screen that is. It’s irritating that a film with a 135-minute runtime can feel so incomplete. Solo has a real pacing issue as the opening act is far too slow, whilst the final act is far too quick. It’s as if writers Lawrence Kasdan (who also wrote, The Empire Strikes Back) and his son Johnathan Kasdan, realised that they had spent too much time with the opening act and so they just ended the film abruptly. The film rushes towards its conclusion, leaving the audience largely unsatisfied. One of the most frustrating aspects of Solo is that it frequently underutilises its most interesting characters. One of the standout characters was Rio (Jon Favreau), an entirely CG created character, who was actually the funniest character in the entire film. From the moment he appeared on-screen, I was intrigued. Therefore, I was frustrated with his character’s minimal screentime. Another interesting character that was completely sidelined for the majority of the film was Val (Thandie Newton). Her character was a bit of an enigma in the marketing, with a mere three shots of the character from two full trailers. This, of course, led to prevalent rumours circulating around her character’s role in the film, with some believing that she may be the main villain of the film. As it turns out, the reason she barely appeared in the marketing, is because she is barely in the film. Another frustrating example of Disney hiring great actors for tiny roles. Then there’s the villain, Enfys Nest, who was the other main enigma from the marketing. The character is barely worth mentioning as they bring nothing to the film. Nothing whatsoever. Solo is a film that is guilty of relying on nostalgia. It tries so hard to evoke the emotions of the audiences that grew up with the original trilogy through its aesthetic look and tone. One of the major surprises that I mentioned is a prime example of Solo relying too much on nostalgia, with the only difference being that it is an attempt to evoke nostalgia for the prequel trilogy. Granted it worked wonders for me but it will almost definitely do nothing but frustrate the older generations who have nothing but contentment for the prequels. I was feeling let down right from the start of the film. Traditionally Star Wars films have an opening title crawl, supported by John Williams’ spectacular fanfare. However, Kathleen Kennedy has repeatedly stated that the standalone films would not have these, as supported by Rogue One‘s lack of fanfare and opening crawl. This has left many fans disappointed but not me. I actually appreciated that Lucasfilm was trying to make the standalone films unique. So I was annoyed when Solo begins with what is essentially a title crawl. Instead of STAR WARS being plastered across the stars followed by three paragraphs, the events of the film are explained in three paragraphs, in the same font format as “A long time ago in a galaxy far, far away”. It feels like a cheap tactic to have an opening crawl. I wanted the film to show me the story not tell it, but considering how poorly the film is lit, it’s probably a good thing they explained the film to me as I would have seriously struggled to follow what was happening. Arguably the greatest crime that Solo commits is that it does absolutely nothing for the Star Wars franchise. It doesn’t push the franchise forward in exciting new directions like The Last Jedi did. It doesn’t significantly deepen the characters of Han Solo or Lando Calrissian. It simply has them take part in exciting action scenes, firing blasters and flying the Millennium Falcon. It truly is an unnecessary addition to the Star Wars franchise that fails to justify its existence. Lastly, this is more of a nitpick but the film actually chooses to show why Han Solo is called Han Solo! If there was an interesting reason for it, that developed the character further then it wouldn’t feel so out of place. However, it does. It is thrown into the script as casually as a Stan Lee cameo in a Marvel film. In the end, Solo: A Star Wars Story is a forgettable entry into the Star Wars franchise. The film not only fails to add anything significant to the character of Han Solo, but it fails to justify its existence as anything more than a cash grab. Not as bad as The Phantom Menace and definitely not as bad as Attack of the Clones, however, the film is of a lower quality than all of the other entries in the franchise, and marks a real low point for the Disney era of Star Wars. ‘Ant-Man and the Wasp’ moves to August because of the World Cup!? This is just going to be an extremely short post (it’s basically a rant) based on the news that just angered millions of Brits. So despite the love that the world has for Marvel right now, following the release of the highly acclaimed Avengers: Infinity War, it seems that the love is not mutual on Marvel’s part, as they just announced that the next film from the Marvel Cinematic Universe (MCU) would be releasing in the UK later than expected, a whole month later. Originally scheduled to be released on the July 6th, the sequel to Ant-Man will now be released here in the UK on August 3rd, whilst for the majority of the world, it remains July 6th. It’s bad enough that the film has been pushed so far back from the rest of the world, but what makes it frankly insulting is the reason behind this move: the FIFA World Cup. Hosted every four years, the greatest sporting event in history returns, this time in Russia, as 32 national sides compete for the greatest trophy in the entire sport of football. It is so popular that Marvel is afraid that the entire population will be so captivated by the month-long event, that no-one will go out to see their film. Now I love football as much as the next guy but considering Scotland didn’t even qualify, and watching England get humiliated will only last about a week, as they’ll be knocked out in the group stages, I have no personal interest in the tournament. You’d think that Marvel would want to capitalise on the World Cup by advertising it during matches, to grab the attention of fans, who would perhaps go see the film once the match has ended. Apparently not. There’s also the fact that not every Brit likes or even cares about football. People who would much rather sit down in a cinema, watching their favourite characters on the big screen, are being forced to wait a full month longer than the entire world (except China probably). This also brings up the fact that in today’s society, through social media sites such as Facebook and Twitter, information is shared instantaneously, meaning that we will have to try to do the imaginable: survive a full month without being spoiled. It’s incredibly likely that fans will be spoiled sometime between the worldwide and UK releases, which could quite possibly kill much anticipation for the film. As a result of it, fewer people will feel the need to part with their hard-earned cash to go see a film which they know every single thing about. It’s safe to say that the decision to delay Ant-Man and the Wasp‘s UK release by a full month, is not only insulting to UK fans of the MCU but a decision that could greatly backfire on the studio in terms of their financial gain, as well as their reputation here in the UK. Quite possibly the most ambitious film ever created, Avengers: Infinity War had expectations that were seemingly insurmountable. A film which, ten years ago, audiences never expected to see. Following the glowing receptions to Captain America: The Winter Soldier and Captain America: Civil War, it’s no surprise that Marvel trusted the Russo brothers to helm the film, replacing the departing Joss Whedon. Avengers: Infinity War tells the story of Thanos’ (Josh Brolin) quest to wipe out half of the universe. However, he finds himself challenged by those that refuse to bow down and accept their fate. The film has a story of gargantuan nature. This should come as no surprise considering that there are 18 films prior to Infinity War that in some way or another, set up this film. The film feels epic in scope as Thanos genuinely presents a threat to the entire universe. Similar to other Marvel Cinematic Universe (MCU) films like Guardians of the Galaxy, Avengers: Infinity War tells a story that spans the entire franchise, meaning that the narrative takes the characters to places already familiar to audiences whilst also introducing new locales. Despite already being 18 films in, the MCU continues to expand and the worldbuilding in Infinity War is as good as it has ever been. There was a lot of excitement and nervousness with the sheer number of major characters that were going to appear in the film. Although the film can feel overpopulated at times, seeing the characters interact, some for the first time, is a sight to behold. There is an especially hilarious interaction between Thor (Chris Hemsworth) and Peter Quill/Star-Lord (Chris Pratt). It’s not a major interaction that affects the plot in any significant way, however, it does a brilliant job of establishing the character dynamics and sets the stage for what ends up being a side-splitting running gag. Although the cast is overfilled, and some characters have bare minimum roles, everyone gets a chance to have their own individual standout moment. 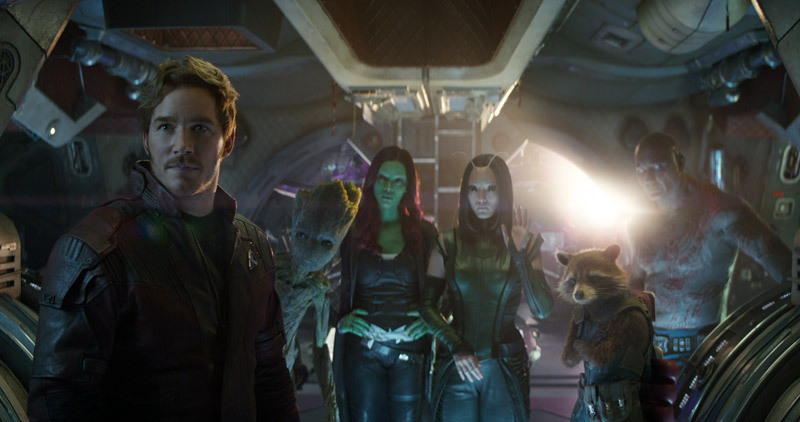 Out of all the heroes, the Guardians are easily the highlights, with a smart sense of humour and surprisingly, act as the core of the emotional weight in the film. Nonetheless, although this film is called Avengers: Infinity War, this is Thanos’ film. He is the main character and an extraordinary one at that. Right from the opening five minutes, he makes his presences known as a real and terrifying threat to the universe in a tense opening scene. What makes Thanos an extraordinary character is that his motivations are rational. His plan to wipe out half of the universe actually makes sense. Not only that but he too has a great deal of emotional baggage that sets him apart from the majority of other MCU villains, and cinematic comic book villains in general. I was particularly worried about the fact that he is a completely CGI creation. We’ve seen villains like this in the past that look terrible (*cough* Doomsday in Batman v Superman *cough*). Thankfully, he looks amazing, as he should for a film with a budget somewhere between $300-400 million and Josh Brolin is perfectly cast as the ‘Mad Titan’, in a role he was seemingly born to play. Another concern that many fans had was regarding the humour and just how much would feature in the film. The Russo brothers adopted the same approach that they made towards Civil War, with humour that is mostly subtle (except with the Guardians) and not overshadowing the gravitas of the situation at hand. There are times, when the jokes do feel totally out-of-place, considering the events that unfold throughout the film. However, for the most part, Avengers: Infinity War successfully continues the grand tradition of Marvel comedy, whilst also focusing on the dramatic, emotional aspects of the narrative. There are several new additions to the MCU in Infinity War, but none make such an impression as the Black Order. It’s very rare for secondary villains to make much of an impression on the audience but Thanos’ children, the Black Order, especially Ebony Maw (Tom Vaughan-Lawlor) do just that. Creepy and powerful, Ebony Maw has such an intimidating presence that I’m a little disappointed that he wasn’t the main villain in another film. The rest of the Black Order are more mixed, although impressive in design, they offer little more than punching bags for the heroes. That being said, they are involved in a particularly excellent action sequence set in Edinburgh which actually serves as their main introduction. I just need to say how bizarre it is seeing several of the Avengers running around Waverley Station considering I’m there almost every week. The Black Order was a good addition although it’s just unfortunate that they weren’t used more and that the most interesting of them all had the least screentime. The MCU has been very much a mixed bag in terms of visual effects, with The Avengers often looking like an expensive TV production. That is not a problem that Infinity War faces as the visual effects are among the best of the MCU, with its CGI creations including the characters Thanos and the Black Order, and exceptional fully CG locations. There are a couple of moments, most notably during the battle of Wakanda, that has been heavily featured in the trailers, where the CGI is very noticeable. However, these moments are minuscule and do not distract from the brilliance of the rest of the visual effects. As I mentioned earlier, there is a real sense of emotional weight to the film. By the end, you really do feel that nothing will ever be the same for the characters or the universe. We have spent, in some cases, a decade with these characters on our screens and whenever a beloved character is in pearl, the audience feel the dread hit them like a hurricane as there is a real sense of danger in the film thanks to the fantastic opening five minutes. As the film played out, I found myself becoming emotionally invested in Thanos, as he is so expertly written to be a complex, thought-provoking character. One thing that the film excels at is surprises. There are so many surprises in this film which of course I won’t spoil. I will say one surprise, in particular, made me jump in my seat with excitement and left my jaw on the floor. As expected, having seen The Winter Soldier and Civil War, the Russo brothers craft more enthralling action set pieces. There are several great moments of action spread throughout the entire film but none are as epic or impressive as the final thirty minutes. It’s so frustrating trying to write about it without spoiling it so I’m just going to say that the final thirty minutes alone are worth going to see Infinity War for. I’m also just going to say that the ending is the greatest ending to a comic book film ever. Quite simply incredible. So although there are a lot of positives with Infinity War, it is not a perfect film. The cast is far too big and there is far too much going on at the same time. The film tries to balance all of the storylines that unfold, repeatedly switching between them but as there are so many, it often means that by the time we return to certain ones, a reminder of what was happening is actually needed. It becomes a chore to remember everything that is happening and the characters that are involved. One particular storyline that I hated was Thor’s. He ventures off on his own task and every single time it cut back to his storyline, I internally groaned as it was vastly inferior to the other storylines. There was some confusion over whether or not Peter Dinklage was a part of the cast, however, his role was eventually confirmed by one of the posters. Again, I won’t spoil it, but he is involved with Thor’s storyline and it was a role that really could have been done by anyone. Furthermore, as there are so many characters, it’s not surprising that there is very little character development for anyone other than Thanos. After all, this is his film and he does have the most screentime. The film is relentlessly paced (which is certainly not a bad thing), but it does often leave the characters in its wake. The film initially sets up potential developments, but more often than not, never follows through on them. Lastly, although the battle of Wakanda is excellent, it is just the heroes fighting another CGI army. As a result of this, it is often videogame-esque in its design. It is blatantly apparent at times that the actors are punching at nothing, which is, of course, frustrating. In the end, Avengers: Infinity War is a thoroughly entertaining, though not perfect film that succeeds despite all the odds against it.